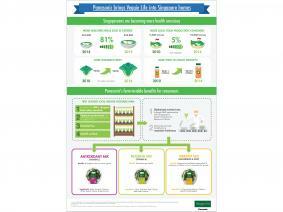 Panasonic Factory Solutions Asia Pacific (Panasonic) retails locally-harvested produce from its indoor agriculture facility under the Veggie Life brand. 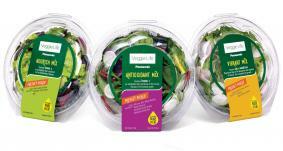 Singapore, Singapore - Extending commercial operations of Singapore's first licensed indoor vegetable farm, Veggie Life salad mixes are now available at selected local supermarket chains to offer customers a truly farm-to-table salad experience. In the last year, the indoor farm has also expanded its annual production capacity from 3.6 tonnes to 81 tonnes. It is on target to contribute 5% to Singapore's local production by FY2016 (*1). Hideki Baba, Managing Director, Panasonic Factory Solutions Asia Pacific said, "In Singapore, land scarcity can prove challenging. From its inception, our aim with the indoor vegetable farm is to combine Panasonic's technological and manufacturing expertise to contribute to Singapore's food self-sufficiency level and consistently cultivate top-quality crops via a sustainable agriculture system. Locally-sourced and therefore fresh ingredients are crucial to the farm-to-table experience, and we are pleased to be able to provide that through our Veggie Life salad mixes. Further, there is growing support for local food production in recent years." Veggie Life currently offers a range of three nutrient-dense salad mixes for consumers on-the-go: Antioxidant Mix, Nourish Mix and Vibrant Mix (*2). These are available at the following supermarket chains: Emporium Shokuhin, Isetan Scotts supermarket, Isetan Westgate supermarket and MEIDI-YA. By the end of this month, consumers will also be able to enjoy Veggie Life salads at Big Box Hypermart and selected FairPrice supermarkets. Veggie Life salads feature locally-harvested, premium quality vegetables that are cultivated in the indoor farm's controlled soil-based, pesticide-free environment with optimum cultivation conditions to ensure stable, nutritious, high-quality production, complying with AVA and HACCP's stringent food safety standards. The produce is then harvested, packaged on-site and delivered on the same day to maximise freshness. 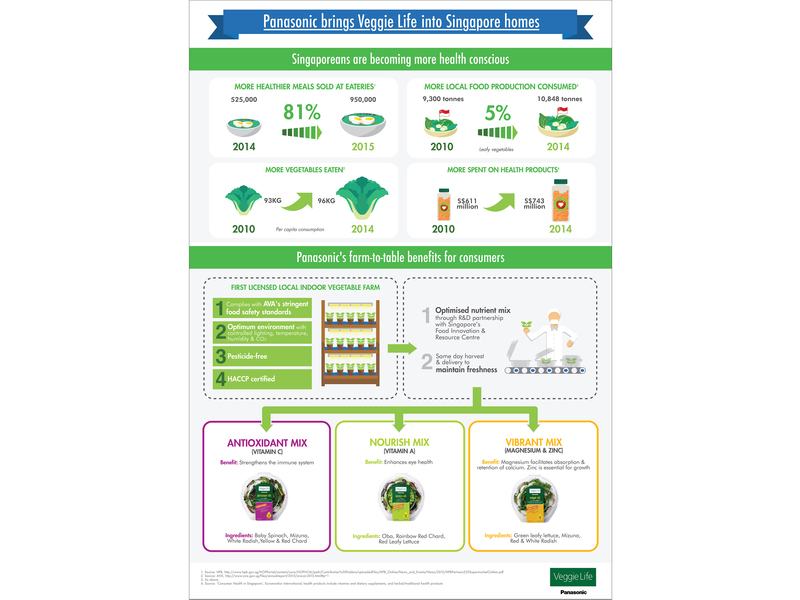 In collaboration with Singapore's Food Innovation & Resource Centre, Panasonic led research and development efforts to ensure that the ingredients of each Veggie Life salad combination provide optimal nutritional benefits to support a healthy lifestyle and complement in taste. Since July 2014, the indoor agriculture farm has expanded its cultivation area to 634m2 from 77m2. 38 types of vegetables are now harvested in the facility, supporting an annual production capacity of 81 tonnes. The indoor farm has put in place a seeding and potting automation system which helps double productivity. At present, Panasonic supplies to HORECA (hotels, restaurants and catering companies) such as Resorts World Sentosa, Les Amis Restaurant and Ootoya Japanese Restaurant. Looking ahead, the company will assess market demand for further commercial expansion to restaurants and other supermarkets. As one of the leading factory automation solutions providers, Panasonic Factory Solutions Asia Pacific is committed to design and develop indoor agriculture solutions to meet market demand for stable and sustainable production of locally-harvested premium quality crops.